A team of scientists studying solar cells made from cadmium telluride, a promising alternative to silicon, has discovered that microscopic “fault lines” within and between crystals of the material act as conductive pathways that ease the flow of electric current. This research—conducted at the University of Connecticut and the U.S. Department of Energy’s Brookhaven National Laboratory, and described in the journal Nature Energy (“Charge transport in CdTe solar cells revealed by conductive tomographic atomic force microscopy”), may help explain how a common processing technique turns cadmium telluride into an excellent material for transforming sunlight into electricity, and suggests a strategy for engineering more efficient solar devices that surpass the performance of silicon. “If you look at semiconductors like silicon, defects in the crystals are usually bad,” said co-author Eric Stach, a physicist at Brookhaven Lab’s Center for Functional Nanomaterials (CFN). As Stach explained, misplaced atoms or slight shifts in their alignment often act as traps for the particles that carry electric current—negatively charged electrons or the positively charged “holes” left behind when electrons are knocked loose by photons of sunlight, making them more mobile. The idea behind solar cells is to separate the positive and negative charges and run them through a circuit so the current can be used to power houses, satellites, or even cities. Defects interrupt this flow of charges and keep the solar cell from being as efficient as it could be. But in the case of cadmium telluride, the scientists found that boundaries between individual crystals and “planar defects”—fault-like misalignments in the arrangement of atoms—create pathways for conductivity, not traps. Members of Bryan Huey’s group at the Institute of Materials Science at the University of Connecticut were the first to notice the surprising connection. In an effort to understand the effects of a chloride solution treatment that greatly enhances cadmium telluride’s conductive properties, Justin Luria and Yasemin Kutes studied solar cells before and after treatment. But they did so in a unique way. 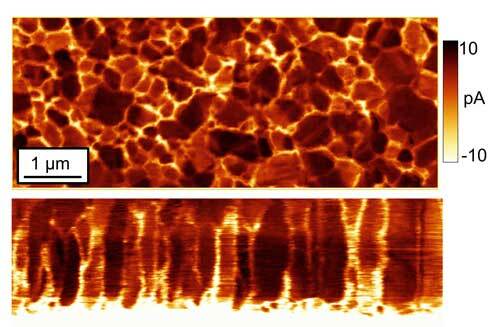 Several groups around the world had looked at the surfaces of such solar cells before, often with a tool known as a conducting atomic force microscope. The microscope has a fine probe many times sharper than the head of a pin that scans across the material’s surface to track the topographic features—the hills and valleys of the surface structure—while simultaneously measuring location-specific conductivity. Scientists use this technique to explore how the surface features relate to solar cell performance at the nanoscale. But no one had devised a way to make measurements beneath the surface, the most important part of the solar cell. This is where the UConn team made an important breakthrough. They used an approach developed and perfected by Kutes and Luria over the last two years to acquire hundreds of sequential images, each time intentionally removing a nanoscale layer of the material, so they could scan through the entire thickness of the sample. They then used these layer-by-layer images to build up a three-dimensional, high-resolution ‘tomographic’ map of the solar cell—somewhat like a computed tomography (CT) brain scan. The resulting CT-AFM maps uniquely revealed current flowing most freely along the crystal boundaries and fault-like defects in the cadmium telluride solar cells. The samples that had been treated with the chloride solution had more defects overall, a higher density of these defects, and what appeared to be a high degree of connectivity among them, while the untreated samples had few defects, no evidence of connectivity, and much lower conductivity. Huey’s team suspected that the defects were so-called planar defects, usually caused by shifts in atomic alignments or stacking arrangements within the crystals. But the CTAFM system is not designed to reveal such atomic-scale structural details. To get that information, the UConn team turned to Stach, head of the electron microscopy group at the CFN, a DOE Office of Science User Facility. “Having previously shared ideas with Eric, it was a natural extension of our discovery to work with his group,” Huey said. CFN staff physicist Lihua Zhang used a transmission electron microscope (TEM) and UConn’s results as a guide to meticulously study how atomic scale features of chloride-treated cadmium telluride related to the conductivity maps. 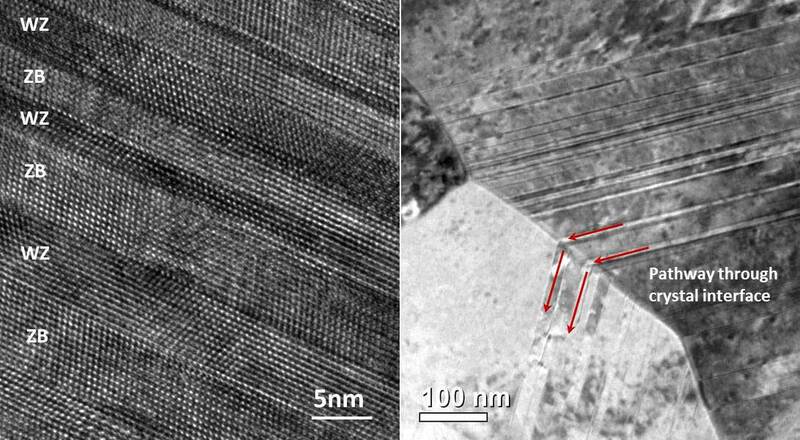 The TEM images revealed the atomic structure of the defects, confirming that they were due to specific changes in the stacking sequence of atoms in the material. 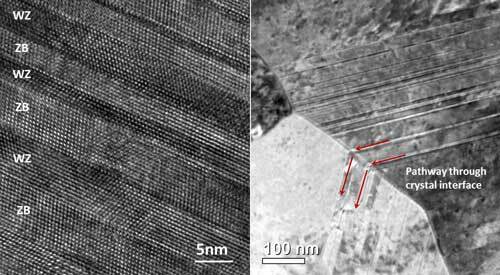 The images also showed clearly that these planar defects connected different grains in the crystal, leading to high-conductivity pathways for the movement of electrons and holes. The authors say it’s possible that the chloride treatment helps to create the connectivity, not just more defects, but that more research is needed to definitively determine the most significant effects of the chloride solution treatment. In any case, Stach says that combining the CTAFM technique and electron microscopy, yields a “clear winner” in the search for more efficient, cost-competitive alternatives to silicon solar cells, which have nearly reached their limit for efficiency. This entry was posted in Nanotechnology and tagged Environment, Genesis Nanotechnology, Nanomaterials, Nanotechnology, Renewable Energy, Solar energy, Telluride.